Four years ago last month, Commandant Gen. James Conway announced that he had selected Sgt. 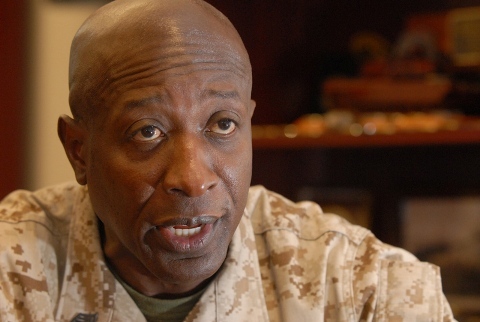 Maj. Carlton Kent to serve as his sergeant major of the Marine Corps. It’s a demanding position that requires those who hold it to be equally comfortable while offering blunt advice to a four-star general, inspiring junior Marines and articulating the Marine Corps’ needs on Capitol Hill. Following Conway’s retirement in October, the time is coming for Kent to move on, too. The sergeant major is expected to retire this spring after completing a four-year term as the Corps’ top enlisted Marine. He has held the position since April 25, 2007. Commandant Gen. Jim Amos is expected to announce who will replace Kent soon, following a series of meetings last week by a board of general officers. They vetted and interviewed candidates, with Amos expected to personally interview five finalists for the position in Washington. In this week’s Marine Corps Times, we explore the process and who may be in contention, highlighting the senior enlisted leaders who could get a look. Their resumes are impressive, and some have held the sergeant major rank since the early part of the century. The commandant’s office has remained mum on its plans — for now, at least. 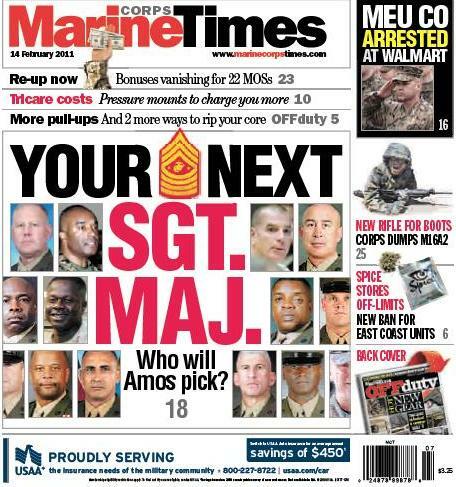 For more on the contenders and additional thoughts from Amos and Kent on the process, check out the Marine Corps Times on newsstands now or subscribe here. Sargent Major Greg Grizzle has all the qualities that make up the marine corp. Physically, he PT’s at 100% everytime and speaks soft but with effectiveness. He has my vote. Because PTing 100% of the times makes him qualified to be the next SgtMajMC? You need forward thinkers for the future of the corps and plans on how to get it there.